This Advent I explored the collects for the season from the Sarum Missal,1 taking us on a journey of expectation, calling upon the Lord to come down into our lives and stir up our own souls to do good deeds as well as to succour us in the midst of our own sinfulness. My original plan had been to approach Advent from the angle of Late Antiquity and the Early Middle Ages, as I’d been posting about Late Antique and Early Medieval liturgy in November,2 but I discovered that those liturgical books I have easiest access to give us nothing for Advent. But Christmas is a different story. I turn our attention now to the Leonine Sacramentary. This liturgical book is not, technically speaking, a sacramentary. Sacramentaries are precursors to missals and have in them all the things you need for the feasts of the liturgical year and the saying of the Mass. 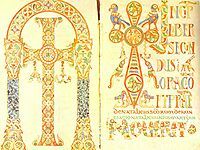 The Leonine Sacramentary, ms Verona lxxxv, of the seventh century, is a collection of prayers to be said at Mass, arranged by the secular year, and does not include the actual liturgy of the Mass. The manuscript is damaged and begins in April. It was initially imagined to be by Leo the Great because of how old it seems to be, and because Leo is said to have made some modifications to the Roman liturgy. The collection is texts is now thought to be later than Leo but likely draws upon much fifth- and sixth-century manterial. From what I understand, it is a ‘pure’ ‘Roman’ form of the liturgy, from a time before the West was engaged in a lot of cross-pollination between Frankish Gaul/Germany and Italy, or the Eastern Mediterranean and Italy. Let’s look at the text. Frankly, this prayer is more than enough for a blog post! Could anything me more Leonine? The balancing of ‘wondrously’ (mirabiliter) with ‘more wondrously’ (mirabilius) is a strikingly Leonine parallel, as when this great pope speaks in his Tome (Ep. 28) of Christ’s birth that was singularly wondrous and wondrously singular. At a deeper level, the issue of ‘human substance’ is itself a deeply ‘Leonine’ theological concern (I refer the reader to J Mark Armitage, A Twofold Solidarity: Leo the Great’s Theology of Redemption) — Jesus Christ is consubstantial with us through his birth through St Mary the Virgin and with God the Father through being God, the Word, Incarnate. What has not been assumed has not been healed. Through Jesus Christ’s participation in our humanity (to return to the text of the prayer), God has ‘more wondrously reformed the dignity of the human substance’. As I say, the thoughtworld is deeply, inescapably Leonine here. I am revelling in it as I type. And what is the actual petition in this collect? ‘That we may be sharers in the divinity of Jesus Christ your Son’. This, my friends, is Theosis. We, as the adopted children of God, enjoy by grace what Christ enjoys by nature. He was a participant in humanity. We can participate in divinity. He became man that man might become God (St Athanasius, On the Incarnation, 54.3). Quick closing musings. We should not be surprised that a Veronese liturgical codex of the 600s has such strong Leonine influences, especially on its Christmas prayers. Christmas is when Leo is most quoted. Furthermore, I think that Verona is in that part of Italy that entered in to schism with Rome over the ‘Three Chapters’ following the Council of Constantinople in 553 (the Istrian Schism) — the final reconciliation did not occur until during the pontificate of Pope Sergius in 700. The ‘Tricapitoline’ Christians in northern Italy were hardline, conservative followers of Leo and Chalcedon who felt that the council of 553 had abrogated Chalcedon, and therefore Leo the Great. Leo, as a result, was very close and very dear to their hearts. That his theology would penetrate a Veronese codex, then, is no issue. As you reflect on these rich theological truths, rooted in Scripture and tradition, I hope that the joy of Christ’s Nativity will fill hearts with joy! Merry Christmas! Christus natus est! Merry Christmas, one and all! Here are some bits from St. Leo the Great himself, translated by yours truly. Originally published in PRINT, the magazine of Little Trinity Anglican Church, Toronto. Latin ed. Chavasse, CCSL 138, pp. 125f. Indeed, on all days and at all times, dearly beloved, the birth of our Lord and Saviour from his Mother the Virgin comes before the souls of the faithful while meditating upon divine things, and the mind, raised up to confessing its creator, whether it is turned to the groan of supplication, or in the exultation of praise, or in the giving of sacrifice[—while all this transpires—]nothing more frequently and nothing more faithfully attaches to the spiritual insight than this: God, the Son of God, begotten from the co-eternal Father, was indeed also born from a human birth. But no day brings this nativity to be worshipped in heaven and on earth to us more than today, and with a new light also shining in the elements, it brings total clarity of the miraculous mystery in to our senses. For not only in memory but also in a certain way into view the conversation of the Angel Gabriel with amazed Mary returns, as does the conception from the Holy Spirit as wondrously promised as believed, the Author of the world is brought forth in a virginal womb, and he who established all natures, is made the son of her whom he created. Today the Word of God appeared garbed in flesh, and that which had never been visible to human eyes began even to be tangible to hands. Today the shepherds learned from angelic voices that the Saviour was born in the substance of our flesh and spirit, and today the form of evangelisation was prearranged amongst the superintendents of the Lord’s flocks, so that we also may say with the host of the heavenly army: Glory to God in the highest, and on earth peace to men of goodwill (Luke 2:14). Latin ed. Schwartz, ACO 2.2.1 pp. 26f. Or perhaps he [Eutyches] thought that the Lord Jesus Christ is not of our nature, since the angel sent to Blessed Mary said, ‘The Holy Spirit will come over you, and the power of the Most High will shadow you and, on account of that the holy one who will be born, will be called the Son of God,’ (Luke 1:35) with the result that, since he had been conceived of the virgin by the divine working, the flesh of the one conceived was not from the nature of the one conceiving? But that begetting—singularly marvellous and marvellously singular—is not to be so understood that through the newness of the creation the characteristics of the humanity are removed. The Holy Spirit gave fertility to the Virgin, but the truth of his body was taken from her body, and while the Wisdom of God was building itself a home, ‘the Word was made flesh and dwelt among us,’ (John 1:14) that is to say, in that flesh which he took from a human being and which he quickened with the spirit of rational life. Therefore, as the characteristics of each nature are preserved and come together into one person, humility is taken up by majesty, infirmity by strength, mortality by eternity, and an inviolable nature is united with a passible one for the restoration owed to our condition, so that, since it was fitting for our cure, ‘the one and the same mediator of God and human beings, the human being Christ Jesus’ (1 Timothy 2:5) both could die from the one aspect and could not die from the other. Thus, true God was born in the whole and perfect nature of a true human being, entire in his own characteristics, entire in ours. Latin ed. Chavasse, CCSL 138, pp. 428f. For it seemed illogical and irrational to accept with the mind that the inviolate Virgin begat the Creator of all natures in the substance of a true human being, that the Son of God, equal to the Father, who filled everything and contained all things, permitted himself to be seized by the hands of raging men, to be condemned by a trial of hostile men, and, after dishonours from shameful men, to be affixed to a cross. But in all these things at the same time are the lowliness of humanity and the loftiness of Divinity, nor does the plan of mercy hide away the majesty of the merciful one, since it came from the ineffable power that while true man is in inviolable God, and true God is in passible flesh, glory would be bestowed upon human through injury, incorruption through humiliation, life through death. For unless the Word were made flesh (cf. John 1:14), and so sturdy a unity existed between the two natures, that the brief time of death itself could not break the assumed [nature] from the assuming one, mortality would never have been strong enough to return to eternity. But unique aid was present to us in Christ, so that the condition of death would not remain in the passible nature, which the impassible nature had received, and through that which could not die, that which was dead could be raised up. O God, Who both marvellously established the dignity of human substance and more marvellously reformed it, make it, we beseech Thee through Jesus Christ Thy Son, that we become sharers in the Divinity of Him Who judged it worthy to become a participant in our humanity. Through Jesus Christ our Lord Who liveth and reigneth with Thee and the Holy Spirit, one God, world without end. Amen.